Done-for-you Shopify Dropshipping Business - I Build Your Store For You! 100% Ready For Orders! Let Me Build You A Complete, Turnkey, Fully Functional, Built To Profit Shopify Dropshipping Business! Sick & tired of all the schemes and gimmicks? Done-For-You Shopify Dropshipping Business - Get A Store 100% Ready For Orders! This Is Your Chance To Get Your Piece Of The Multi-Million Dollar eCommerce Pie...Even If You Have ZERO Online Experience! Are you looking for a method to make money online that's proven and will actually work for you and your family? Do you want to predictably earn your living online every single month instead of having slaving yourself to a boss that does not appreciate anything you do? Would you like to make more money in a day than most people make in a full month of work in the dreaded 9 to 5? If your answer is yes, I really urge you to read every single word on this page, because this is really a rare opportunity to work with me personally and have me build your entire business for you from start to finish. Now let's be honest here... Although there are all sorts of methods that you can use to make money online, many are difficult, require a lot of time and effort, or even require skills and expertise most people don't really have, including you. Unfortunately, most people that try to make money online end up struggling and failing, and then they give up. I don't want this to happen to you, so let me explain what you can do about it. The key to success online is to avoid all of the loopholes, easy buttons, schemes, and hype... and truly focus on building a REAL online business. Right now, one of the most powerful business models out there is starting your own Dropshipping business. eCommerce is big... and getting bigger every single day. Have you ever heard of Amazon or eBay? Virtually everyone does some sort of shopping online. It's become so big that there's a day called Cyber Monday, which is the Monday following the popular shopping holiday, Black Friday. And in 2018, Cyber Monday sales are expected to rise to $78.42 Billion! "Yeah, but those are big companies..."
...with little or no prior online experience. So, if eCommerce is so easy, why isn't everyone doing it? Most People That Try To Start eCommerce Stores... FAIL! Most people do a lot of the wrong things when it comes to getting started with eCommerce. To see success with eCommerce and make the kind of money that you want to make, you need to follow a proven roadmap to success. You need someone that's "been there and done that" to show you the ropes and lead you to success with eCommerce. Someone that knows what's working TODAY... not what used to work. High Converting Niche Selection - Instead of wasting your time researching a profitable niche, I'll put my experience & skills into practice and personally do the research for you. All you have to do is choose one niche out of 10 niches that I'll recommend and you're done! High-performing products within your niche - I'll choose AND add up to 15 products to your store, all with proper SEO friendly titles & killer descriptions THAT ACTUALLY SELL. Customized template built to convert - This is the secret between success & failure with your Shopify store. I've spend over $25k developing this theme so you can guess it's built for the highest conversion rate possible. In 2018 alone I've spent $73,789.45 on ads so I can assure you that you get the highest converting layout without spending a single dime. SEO and Social Media Integration - I'll set it up for Google Indexing, and also create the accounts for your Facebook, Instagram, and Pinterest. Instagram Influencer Millionaire - Get my CLIENTS ONLY step-by-step strategy to DOMINATE Instagram and get any IG celebrity to promote your products for dirt cheap so you could enjoy a massive payday and keep all of the money from sales in your pocket without spending a dime on Facebook ads. This guide is NOT being sold anywhere else, so this program is the only place you can find it. You get a complete, in-demand, full-blown business that is battle-tested for success! That is... IF, you know what you're doing. There are little things you must do when you're getting started with eCommerce like getting your store up and running, choosing the right niches and products, and getting traffic that can be the difference in a huge six or even seven figure income and not making any money at all. Because I hand you a turnkey store and a well laid out plan to DOMINATE your niche, EVEN IF you're just getting started. Are you ready to get results, start making money faster, and avoid mistakes that could cost you time and money? If you are then this program is for you, because I don't show you how it's done, I actually put my skills where my mouth is and BUILD YOUR DREAM BUSINESS FOR YOU! If you would like to accelerate your business right now and skip all of the guesswork, my offer is guaranteed the best bang-for-your-buck 100% Optimized Done-For-You Prebuilt Shopify Dropshipping Store. Secure your spot right now, I will only be taking 2 clients per month because of my busy schedule, so you don't want to miss out on this. I will work with you all throughout your Shopify journey. Thanks for taking the time to read, and I look forward to working with you. how much is it? $9,997?? That's correct. 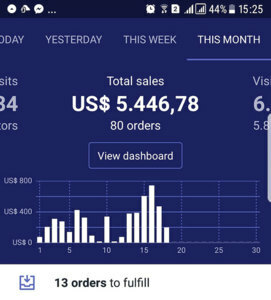 If you're just getting started I can help you build your Dropshipping store for half the price but with less products and functions. Those packages are soon to be added here. What about Marketing do you offer any services for bring sales and results ? Else the shop is of no use . Based on the fact this is $9.997 Warrior Forum really recommends that they use Escrow.com for this type of deal for the buyer protection. Seems as if billionaires are getting into IM now. $10k? For something you can learn from a $15 Udemy course? This is outrageously overpriced. Thats just insane. Even if you have disposable income you wont make that $10K back in a long long time. These people make you think everyone who enters will make millions. So much marketing BS in this sales thread. You can get fully done for you packages with similar functions for less than $600.